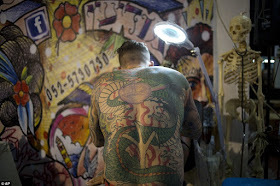 The third annual tattoo convention is taking place over two days in Tel Aviv. Among attendees is Magneto, from Berlin, whose entire face is covered in inkings, including his eyeballs. Fans have travelled from as far afield as Australia, Poland, Russia and the Netherlands.